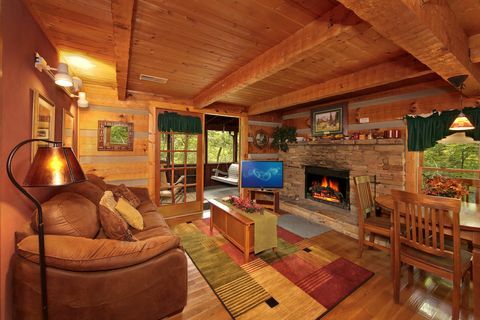 "Top of the Mountain" invites vacationers to the Smokies to unwind in a private Wears Valley cabin rental and forget all the cares back home. 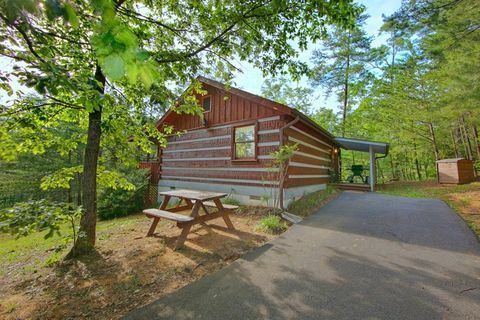 This 1-bedroom Smoky Mountains honeymoon cabin provides seclusion yet rests only a few miles from Pigeon Forge in the scenic Wears Valley, giving you a vacation rental that boasts the best of both worlds. 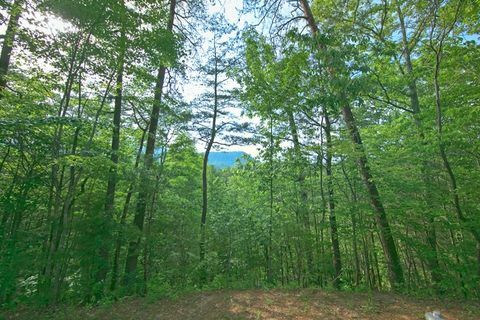 While Wears Valley offers several unique mom-pop shops alongside the scenic roadway into Pigeon Forge or Townsend, you can find plenty to do in either city, making this a great location for couples looking to explore all the Smokies has to offer. "Top of the Mountain" provides a great starting point for any Smoky Mountain adventure you may have. 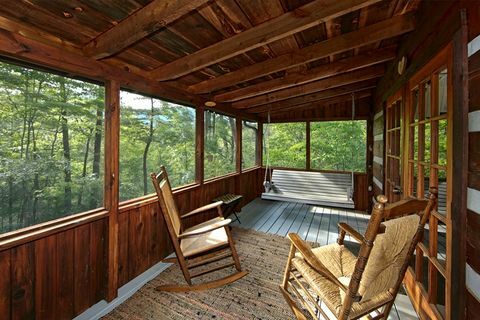 As the sun sets, escape to your romantic, private Wears Valley cabin rental setting for a meal for two cooked on your gas grill or from the cozy, corner kitchen. 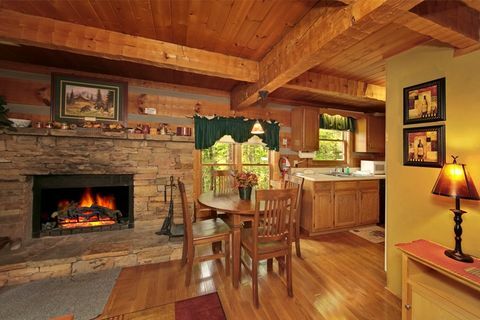 Enjoy a dinner by firelight at dining table for a meal your sweetheart won't soon forget. 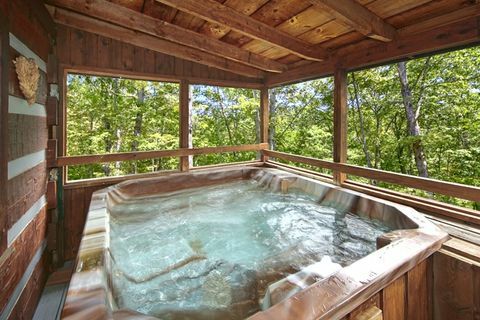 On cold winter nights, cuddle in front of the wood burning fireplace with your sweetheart or take a relaxing dip in the year-round hot tub on the screened in porch. 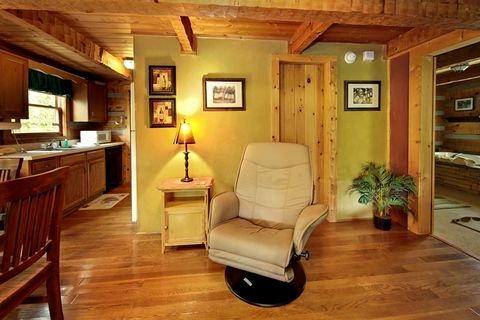 As you retire for the evening, find your way to your Smoky Mountain honeymoon cabin’s king suite. 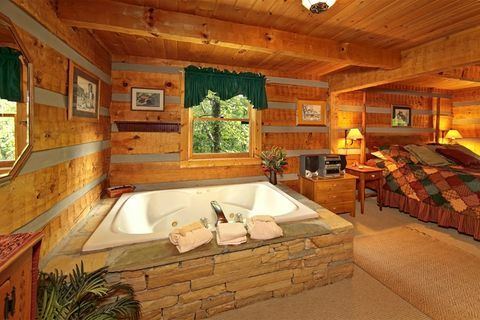 Here, you’ll find a romantic king size four-post bed and an enticing stacked stone jacuzzi tub for two. Set the mood with the bedroom's stereo or curl up together under the covers to enjoy your favorite movie on the television. Need an escape from the everyday? 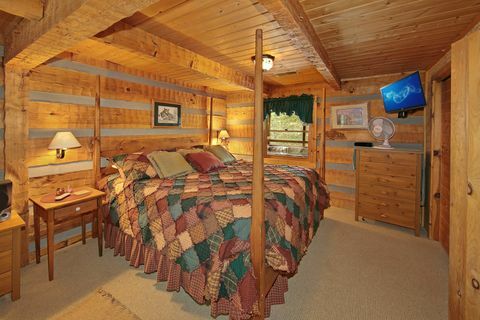 Your private Wears Valley cabin rental provides the privacy you want at your getaway on "Top of the Mountain!" 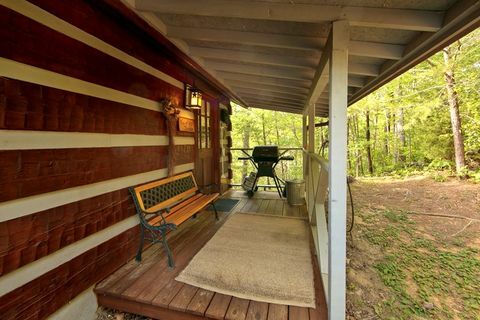 Because of its location, four-wheel drive is highly recommended for this cabin. 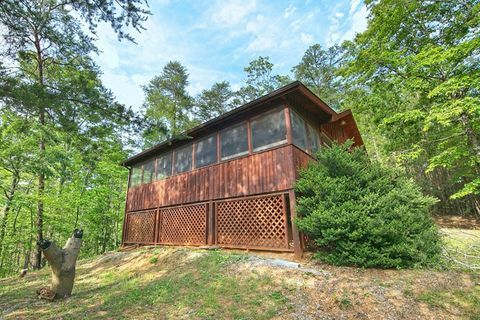 Remember, book your private Smoky Mountain honeymoon cabin ONLINE with Cabins USA Gatlinburg and you get an immediate Online Cabin Special!